Four years ago, when I was investigating various salacious lawsuits filed against the County of Maui, alleging all manner of mismanagement at the county Prosecuting Attorney’s office, I asked a number of local defense attorneys for context and insight. Unanimously, they said that the lawsuits–which alleged misconduct under the administration of former Prosecutor Benjamin Acob–were symptomatic of the “chaos” under Acob’s reign. But the attorneys also said that Prosecutor’s office had definitely calmed down under John D. Kim, who’s run the office since 2011. But recently similar accusations began plaguing Kim–unfair treatment of employees, a considerable backlog of cases, high employee turnover. Most distressing to County Councilmembers Mike White and Don Guzman (who is a former deputy prosecuting attorney) seems to be the news that in 2009, then-Deputy Prosecuting Attorney Kim was reprimanded by his superiors. 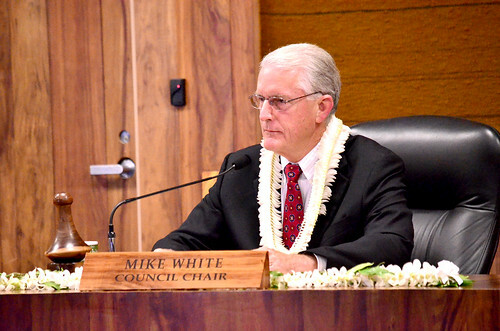 White and Guzman referred to the reprimand during a special Maui County Council meeting on Mar. 3. Both council members said they learned of reprimand was discovered in a court document and that Kim has not explained to them what happened (they also admitted that it apparently never came up during Kim’s first appointment, back in 2011). Despite a legion of other Prosecutors testifying that Kim was great, it was enough to derail the nomination by a vote of two to five. Only Councilmembers Gladys Baisa and Mike Victorino voted for Kim, with Councilmembers Bob Carroll, Elle Cochran, Stacy Crivello, Guzman and White voting against him (Don Couch and Riki Hokama were excused). And others outside the office defended Kim as well. Wailuku criminal defense attorney David Sereno provided a spirited defense of Kim. “Me, 15 years ago, I would have said kick him out,” he told the council. “But he needs to stay. The problem with chaos is it creates more chaos. What’s jeopardized is fairness–it’s not about winning, it’s about doing the right thing. And that’s what JD Kim brought to this job.” Deputy Public Defender Jim Rouse echoed Sereno’s comments. But three former Prosecutor’s Office employees and one current staffer–all women–stepped forward to testify that their experience working with Kim was profoundly “unfair.” One of them, Karen Apana, was a former clerk with the Prosecutor’s Office. She testified that she was terminated without cause (she said she got a settlement through mediation after filing a claim against the county). Testimony during the hearing got very heated and personal. And by 11:30am, the hearing had gotten every bit as chaotic as the accusations against Kim. William Sloper, a criminal defense attorney, said he knows Kim very well. Said Kim attending his wedding, and his wife’s funeral. Then he said he knows Guzman very well–and said Guzman was also at his wedding and his wife’s funeral. But then Sloper called Guzman’s opposition to Kim was “misguided political retaliation.” According to Sloper, prosecutors had supported Guzman’s opponent in last campaign (former Councilman Joe Pontanilla), and now Guzman was seeking revenge. At that point, White interrupted Sloper, telling him not to get personal. Victorino seconded that, saying Sloper’s criticism against Guzman was “uncalled for” and threatened to walk out if Sloper continued. “There’s the door,” Sloper said, to which White responded by immediately calling a quick a quick recess. When they came back a minute later, Sloper stopped bashing Guzman. “There has not been a more fair prosecuting attorney in the last 12 years than Mr. Kim,” Sloper said. A few minutes later, Deputy Prosecuting Attorney Richard Minatoya, who accused Guzman in the election of unlawfully assisting abortive Mayoral candidate (and Guzman aide) Neldon Mamuad, started to testify that Guzman was out of line for going after Kim, but someone on the Council yelled “objection!” and White recessed the hearing again. When they returned a couple minutes later, White warned him to refrain from attacking Guzman personally. Minatoya denied that he was personally attacking anyone, then proceeded to accuse Guzman of violating the charter by asking Kim to fire him. When they finally returned a few minutes later, Minatoya quickly concluded his statement by calling for Kim’s confirmation. Guzman then responded to Minatoya, calling allegations that this is all Guzman’s attempt at electoral revenge “absurd.” He then said that Minatoya harassed him at a Don Couch fundraiser (!) and sent him Facebook messages that included images of dead squirrels (!!) and that he would be proceeding with a workplace violence complaint against Minatoya (!!!). Public testimony ended around 12:30. After an hour break for lunch, White came back and made a few comments. At first, he said, he thought the nomination would be a “complete slam-dunk” but that “concerns were brought to us… at the very last minute.” Though he said he was heartened by testimony of deputies supporting Kim, he still had a “heightened concern” about Kim. But Couch defended Kim–even on the issue of his past reprimand, saying that even if that happened, Kim’s done a lot of good since then. Baisa agreed, and made a point other councilmembers had already made: every boss has detractors, but Kim seemed to have far more supporters than critics. Finally around 3:30, Victorino asked if White would call Kim forward to face questioning about the 2009 reprimand. White rejected this, but allowed Victorino to ask him about the employees who were complaining about his management. When Couch then asked Kim if he’d promise not to retaliate against those employees who’ve complained against him, he said his office has a no-retaliation policy. “You don’t know you’re doing a good job unless you get complaints,” Kim added. In the end, the council voted 7-2 to approve Kim for another term (Guzman and Cochran voted no). Nearly every council member also expressed support for both auditing the Prosecutor’s Office and being more diligent when faced with confirming appointees. Whether they actually take those actions remains to be seen.